In 2017, Hawai‘i legislators and Gov. David Ige created the Kupuna Caregivers Program. This program helps family caregivers who work at least 30 hours per week outside the home by providing a $70-per-day benefit in services that could help make home caregiving for aging family members more affordable. It could help provide services such as home healthcare workers, extra help preparing meals, adult daycare costs or transportation when a family caregiver is not available. The program is subject to the availability of funds and paid directly to contracted service providers (not the family caregiver). Provide direct care to a care recipient who is a citizen of the United States or a qualified alien; age 60 or older; and not covered by any comparable government or private home and community-based care service, except ku¯puna care services. The care recipient cannot reside in a long-term care facility and must have impairments of at least two activities of daily living, or two instrumental activities of daily living, or one activity of daily living and one instrumental activity of daily living, or substantive cognitive impairment requiring substantial supervision. 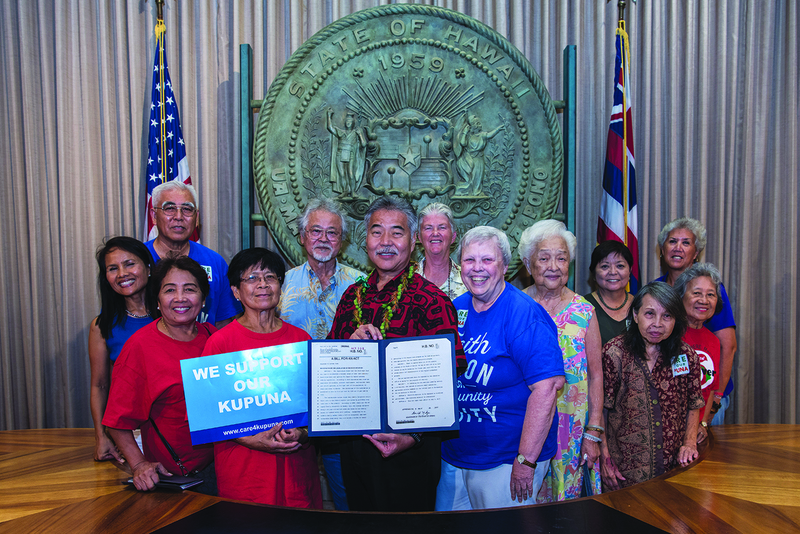 Governor Ige signs the Kupuna Caregivers bill into action with supporters at the Hawai‘i State Capitol. When given the choice, most kūpuna prefer aging at home. This is true for both emotional and financial reasons. Our extended ‘ohana are incredible caregivers but providing that care can create its own financial and emotional stress. According to the Genworth 2017 Annual Cost of Care Survey, the cost of home healthcare in Hawai‘i was more than $10,000 higher than the national average. This is why family members often seek to provide care themselves. But when the caregiver is working full-time, adding care duties to the obligations of a job outside the house brings additional personal strain for the caregiver. Care duties can have an effect on job performance, too: Arriving late after helping an elder get settled or off to adult daycare, reducing hours at work to help take care of a kupuna, or turning down a promotion because of caregiving duties at home. The Kupuna Caregivers Program addresses the needs of both ku¯puna and family caregivers. This is what makes it unique in the nation. Interested caregivers should contact the Aging and Disability Resource Center (ADRC) as soon as possible to apply at 808-643-2372. This also is the number to call to receive further information. From Jan. 1 to June 30, 2018, a total of $600,000 is available to provide these services. FACE, Caring Across Generations, AARP and other organizations will ask the Legislature to provide more money effective July 1, 2018. 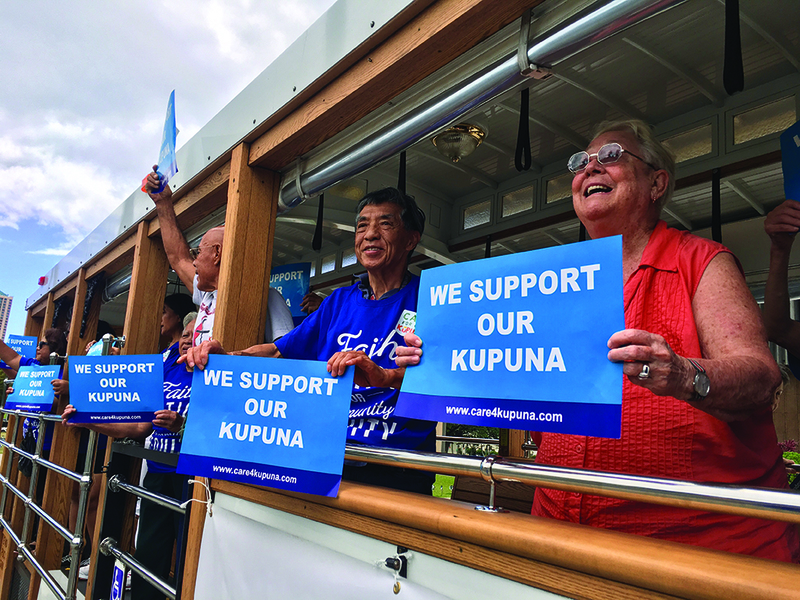 To support this effort to advocate for the Kupuna Caregivers program, visit Care4Kupuna.org.